For nearly a decade, Missisquoi Cupola and Structures inc. has been the go-to source for homeowners and contractors looking for quality built, aesthetically pleasing cupolas made in Quebec, Canada. From residential barns, to small or large homes and garages, our cupolas made in Canada provide both an aesthetic appeal as well as a functional use. 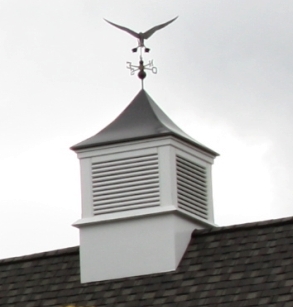 Cupolas are used for both decorative purposes or for ventilation where a louvered model cupola allows warm, moist air to escape from an attic. A cupola providing ventilation is a key component in promoting the longevity of a roofing structure and a well-fitted cupola is a welcome and attractive alternative to the typical metal roof ventilator. 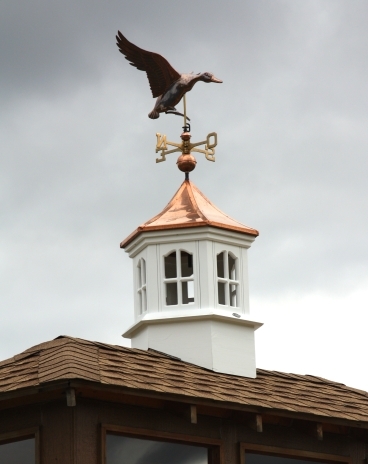 Missisquoi Cupola offers 6 standard cupola models in 3 different sizes. Whether your building suits the traditional look of our Bedford Cupola or the sophistication of our North Hatley cupola, we probably have the cupola you’re looking for. 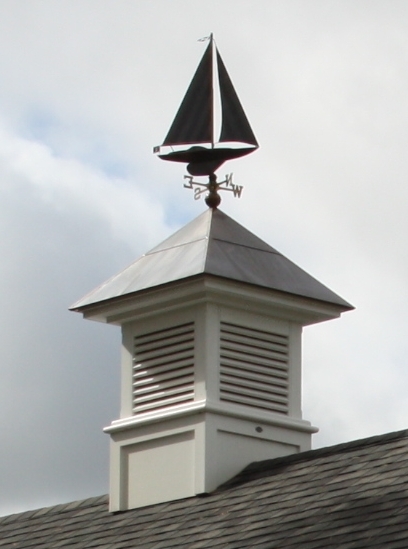 If not, we are always pleased to build custom cupolas: either by following your architects’ specifications or by sitting down together and creating an original cupola design that suits your individual tastes. 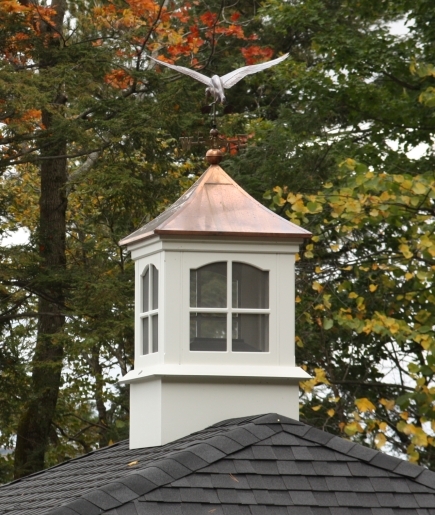 All of our made in Canada cupolas are available with curved or straight roofs, covered with either aluminum or copper. While white is generally the standard color of the cupola itself, we are happy to oblige our customers who provide us with custom color paint for their cupola. We also offer unpainted cupolas and uncovered roofs for the budget-conscious consumer who wants to do the ‘finishing touches’ on the cupola themselves. 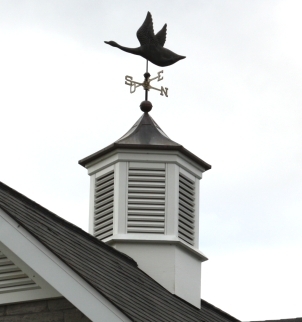 Our cupolas made in Canada are built with #1 select Northern White Pine, Extira® and high density marine-grade plywood. We also reduce our environmental footprint by using acrylic and latex primers and paint. 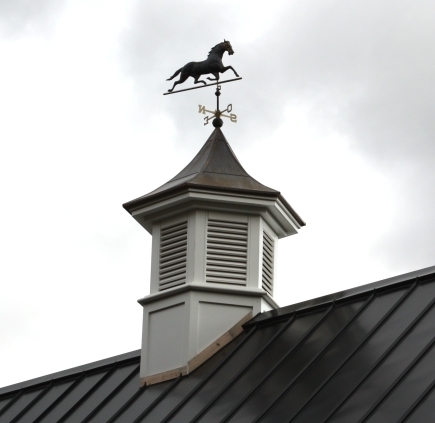 For more industrial applications, we offer maintenance free metal-capped cupolas in several colors. Please contact us for details. Regardless of the model of cupola you select, we are absolutely certain that you will be pleased with the design, quality and value that Missisquoi Cupola is known for. Made in Quebec, Canada with pride! For more information and pricing, please contact us or come in for a visit and take a tour of our beautiful showroom.